Currently viewing the category: "Computer"
Computer Aided Design has come a long way in the last decade, but most of the heavy-duty pro-level apps are still much too complex for the average guy to use for fun. Google offers a much simpler tool called SketchUp (free) that’s popular among the high-end DIY crowd. But what if you’re out and about — like, say, stuck in a waiting room — and want to visualize your latest carpentry concept? There’s an app for that: Woodcraft. Google’s SketchUp relies on Boolean objects — the process of creating standard shapes, then modifying them by adding or subtracting the space overlapping between shapes. Let’s say, for example, you wanted to create an empty box with no lid. You could start by creating a cube. Then you could create a slightly smaller cube, place it inside the other one completely overlapping the top, then subtract. In that case, you’re left with a box with a box cut out of it — or a box with walls sized based on the difference between your original two boxes. Some people go to great lengths to keep their work space clean and free of clutter. This may not characterize your habits, but I think we all can agree that a mess of cables on your desk not only looks bad, but can constantly get in your way. 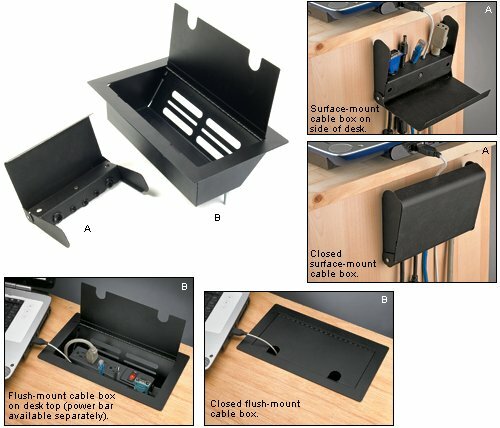 Lee Valley added two promising cable management boxes earlier this year that warrant a look. The first is a 6-1/8″ by 4-1/4″ surface mount box that protrudes 1-1/2″ above the surface of the desk. Made from powder-coated steel, it can be mounted on the side, back, or top of the desk. It has two 7/16″ and three 1/4″ cable ports lined with plastic grommets to protect the cables. A hinged metal lid covers the cables ends when they’re not in use and is held in place by a rare earth magnet. 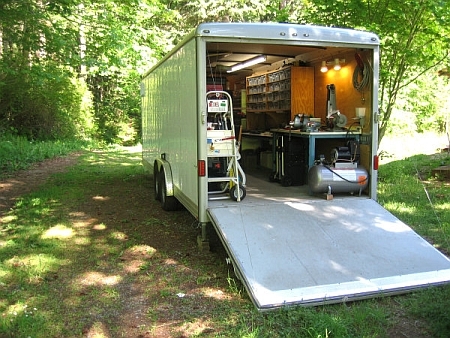 The Make blog reports on Steve Roberts’ outfitting of a 24′ utility trailer as a mobile electronics lab and workshop. Steve’s the guy who has spent the last three decades exploring high-tech bike projects (e.g., Winnebiko and BEHEMOTH; a total of 17,000 miles biking around the U.S.), and a variety of high-tech amphibious and watercraft vehicles. The Make blog reports on a great set of Flickr photos showing how Jim (a.k.a. bondcliff) built a large bench in his new workshop. The picture above shows his Megabench, which he has divided into a “tool” side on the left, and a “nerd” side on the right. The nerd side includes his electronics and craft tools plus an old PC running Ubuntu. The tool side has your usual assortment of — surprise! — tools. 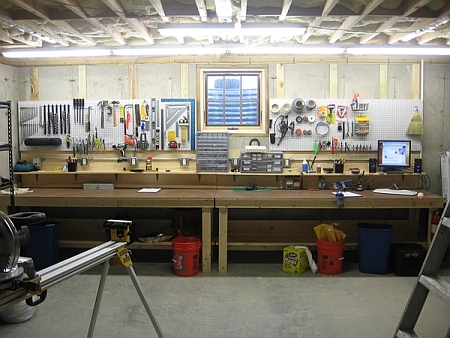 There’s a nice shelf running above the entire length to help keep “clutter” off the benches. A series of outlets over the shelf also runs the length of the benches. 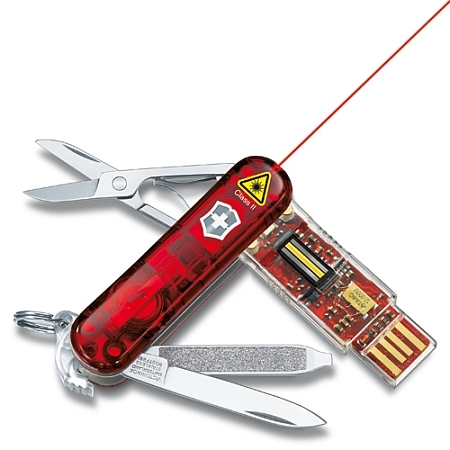 Swiss Army Knife — With Laser! While it’s not the elusive laser-guided screwdriver or hammer, the Victorinox Presentation Master does have a laser pointer, and 8GB, 16GB, or 32GB of USB flash drive storage, and a Bluetooth® remote control, not to mention a blade, nail file with screwdriver, scissors, and key ring. For those of you trying to get through airport security, Victorinox also makes a bladeless version, the Presentation Master Flight. 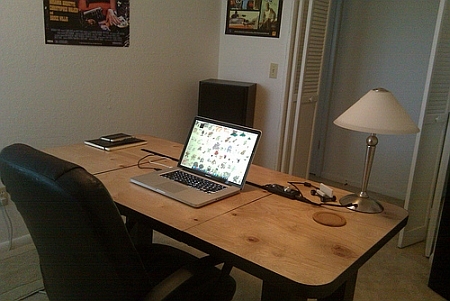 Lifehacker notes this neat computer desk built by one of their readers, Joseperezfm. He admired the features of the commercially-available BlueLounge StudioDesk (shown below), but did not have the budget for its $599.95 price, so he decided to make his own version. I don’t know if this is the same contest that TM noted in 2008 (TM 10/27/08), another episode because they made three of these trucks for a national tour, or some glitch due to the economy — if it’s a continuation of the earlier one, they’re taking forever to pick a winner, or maybe this is turning into a perpetual contest. 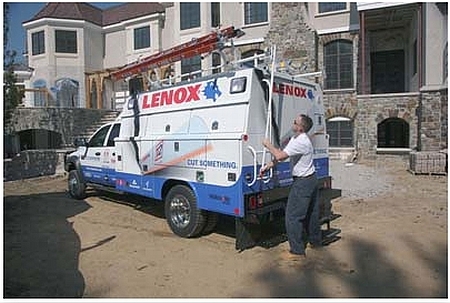 In any case, if you’re “a professional contractor or skilled trade worker in construction and currently employed in the construction industry,” you can enter the Lenox Site Commander Sweepstakes before 5/1/2010, and you could win a pimped-out work truck. The basic truck is a 2008 Dodge Ram quad-cab, four-wheel-drive 5500 HD with a 6.7L Cummins turbo diesel engine, a 6-speed automatic transmission, and a Reading Spacemaster Classic II service body. When we first heard about Home Depot’s iPhone app, we couldn’t help but think back about all the incredible frustration we’ve endured searching for items via Depot’s full website. But hey — we live to serve. So we installed it. And here’s our review. 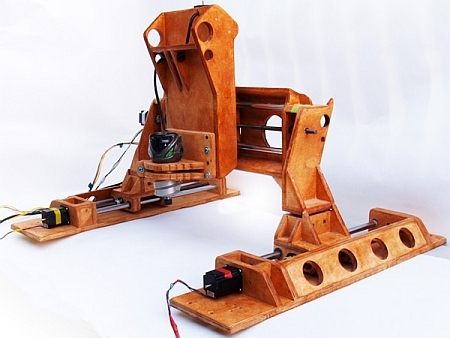 The Make blog notes this portable wooden CNC machine made by Nick Santillan. Nick wanted to experiment with CNC technology without the expense of outsourcing the jobs. He researched building his own and ordered some DIY plans, but, after nearly completing it, decided it was not up to his expectations. After more research and the purchase of better bearings, slides, and so on, he designed and built the wood-framed CNC machine shown above. A commenter after a recent Toolmonger post about French curves complained about the cost of 3D software, which is a very good point. Retail copies of software like SolidWorks, Autodesk Inventor, or CATIA can go for ridiculous amounts. No, seriously. Their markups can make Snap-On reps run for cover. But, as is the case with basically every rule in human history, there’s a loophole. An online retailer called JourneyEd offers software at educational prices, which are massively less than retail. SolidWorks, my graphics program of choice, sells for $140 through JourneyEd, but full retail is $2995. 95.3% off, anyone?